Fire Warden Clarence C. Grimm in 1930. Photo courtesy Marin County FD historical collection. The dedication plaque at the Throckmorton Ridge Fire Station. Photo courtesy Todd Lando, Marin County FD, retired. A mother is left a widow and four children are fatherless as the result of a tragic hunting accident at Woodacre Sunday morning. 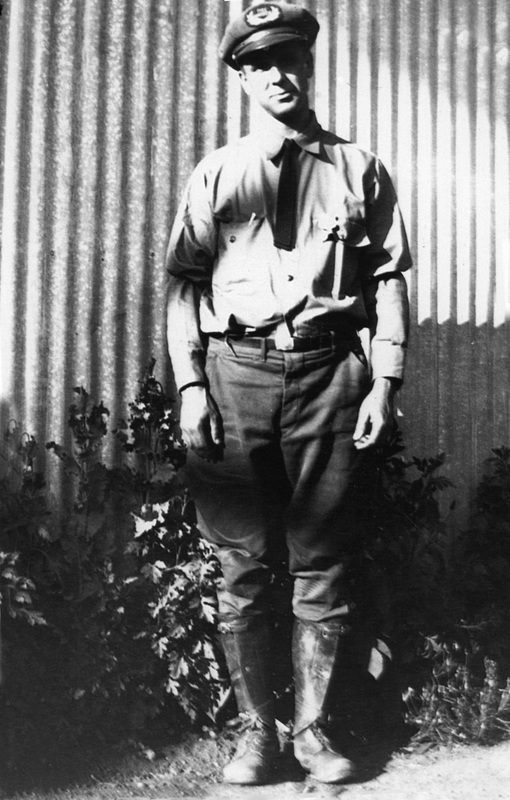 Fire Warden Clarence C. Grimm of the Tamalpais Forest Fire District was shot in the abdomen by a 15-year-old San Francisco boy, Edgar Lee Isaacs, who said he though Grimm was a wild cat. The warden was rushed to the Cottage Hospital, where he died Monday night. Grimm had been in the employ of the Tamalpais forest fire district for five years and was one of the most able men in the service, according to Chief Gardner. Born in Minnesota, Grimm came to Marin County with his family nine years ago. He leaves a wife, Mrs. Anna Grimm, who is president of the Lagunitas Parent-Teacher Association, and four children Donald, 16; Helen, 14; Arthur, 12, and Marianna, 6. The newly rebuilt Marin County FD Fire Station on Throckmorton Ridge was dedicated in Grimm's memory in 2007. 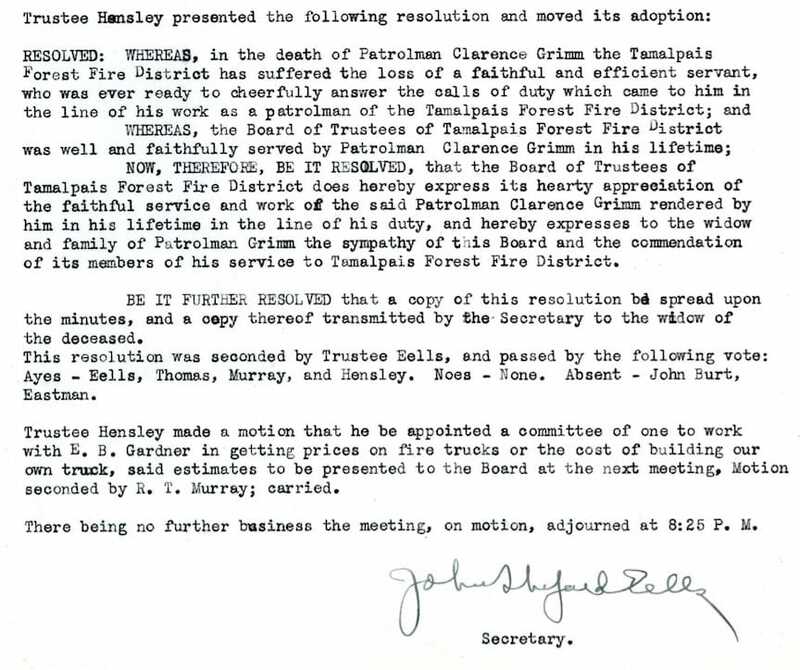 The following resolution is from the minutes of the Tamalpais Forest Fire Distrcit Board meeting held on November 1, 1932. 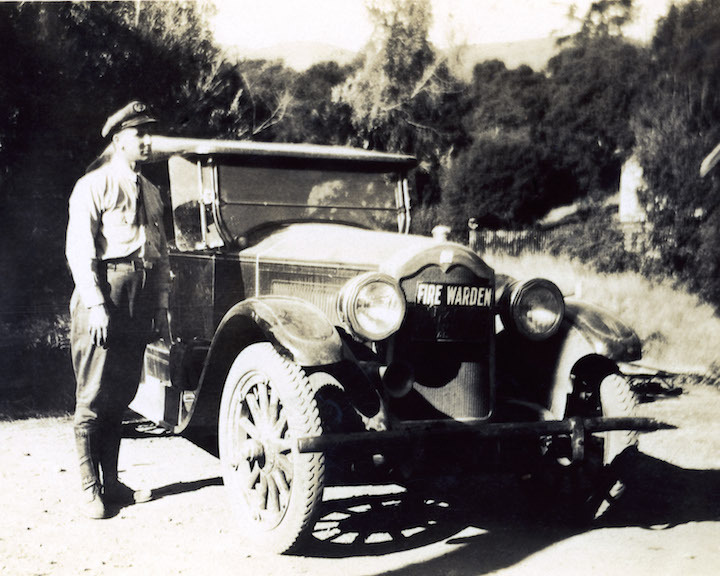 Tamalpais Forest Fire District Fire Warden Clarence C. Grimm in 1930, photo courtesy Marin County FD historical collection.